← The Lure of a Washing Machine, extends a stay in Vitry- Le- Francois, from one Night to Three! For the last two days we have being working our way along this canal to get from Vitry le Francois to Nancy. This canalised river climbs up the valleys and because of the number of locks it’s a very slow progress. Nuala screams not another lock! In two days we have travelled 34.6 km and have gone through 22 locks. 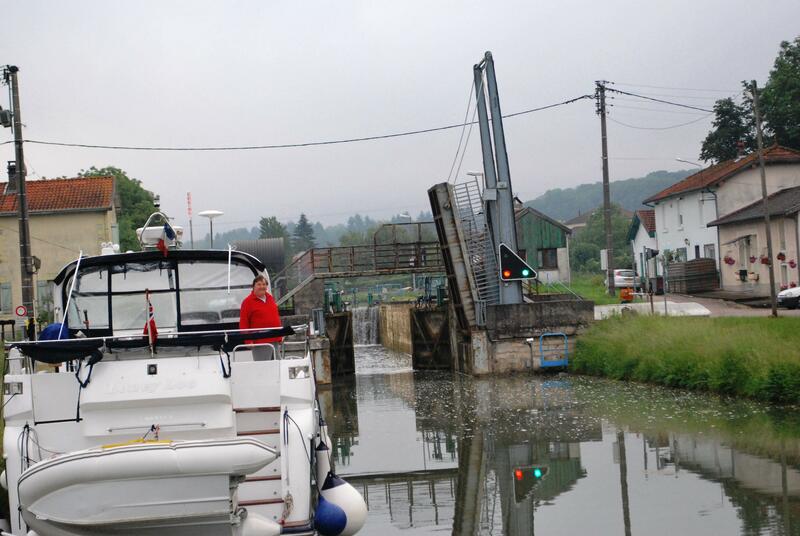 ( Normally we can average 40-50 km per day) .We still have to do another 275 km, 129 locks, The Tunnel du Mauvages, Tunnel de Foug and St Louis Arzviller ladder boat lift to get to Strasbourg. This canal, while still one of the main routes to get from Paris to Strasbourg (and no doubt that’s one of the reasons it’s still open) is little used. A local lock keeper this morning told me that last year they had 400 commercial barges and approximately 60 pleasure boats. This year there have been very few commercial barges because of repair work and loss of a major contract, to haul goods on the canal. I can see why this canal is not commercially attractive because it’s so narrow with so many locks. 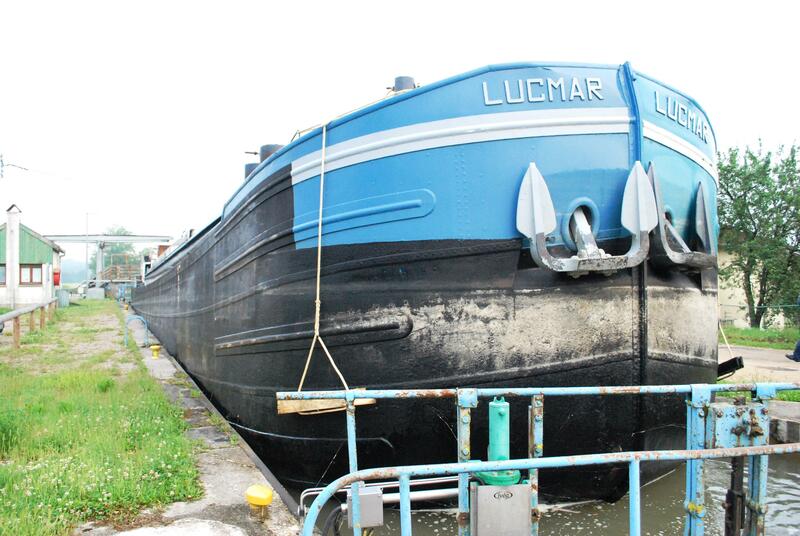 Look at the photos of the one commercial barge that we met in two days and how he just fits in the lock. In fact we had to get up at 6.30 am this morning to mind our boats as he inched past us into the lock with lifting bridge at Mussey. I took a photo of Richard watching as the barge went past. We were ready with engines running and bow thrusters on to protect our boats being shoved up on the bank. Because the canal is so little used, we have had problems getting a number of locks to work. Yesterday we had three locks that would not open for us. At the last one, we caught up with Richard and Karen in “Lonely Loo” who had left Vitry the day before and hours before us,but had been so delayed that we caught up with them. The lock door was hanging off, as the hinge had broken! 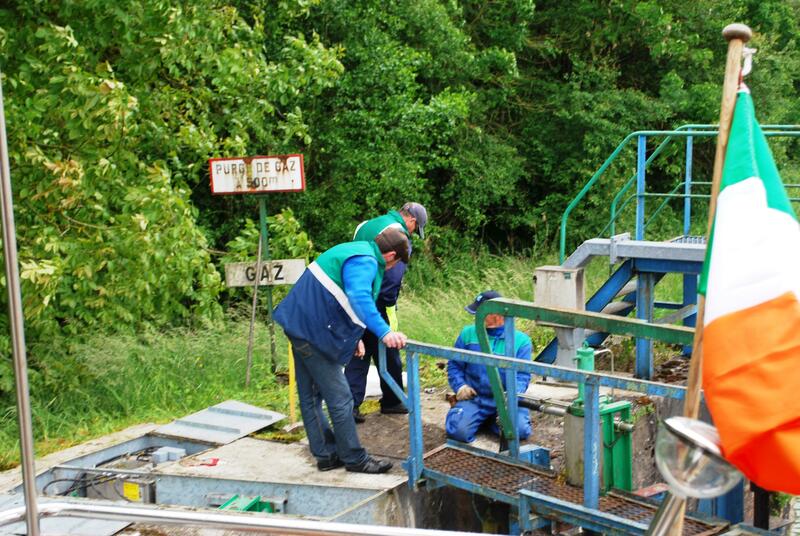 There were about 10 VNF staff (the organisation that runs the canals of France) there working on the lock gate. In fairness to them, they reacted quickly, replaced the failed hinge with a temporary wire strap and had us on our way within 30 minutes, but Richard had been there for two hours. 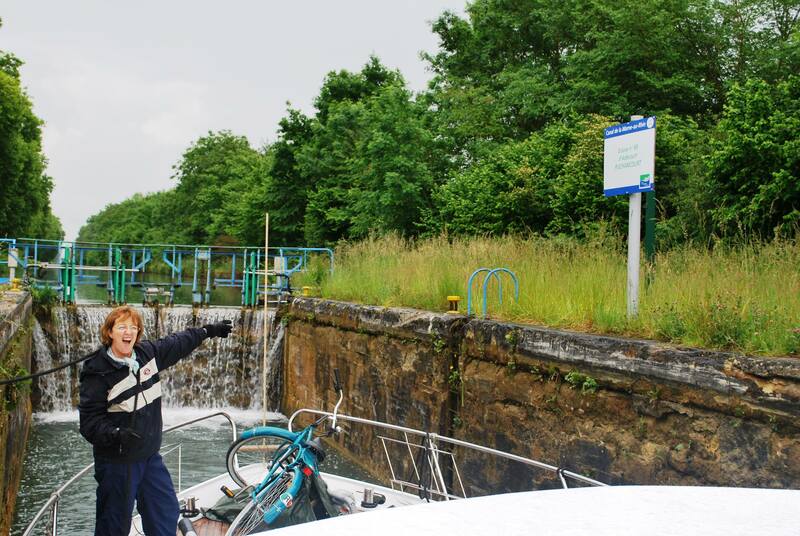 Thank goodness at this stage, Nuala can now take the boat in and out of locks. With two of us able to manage the boat, it makes it easier for us. It is a great experience, we are both enjoying it and a totally different challenge in our Gap Year. All in all, I wonder how long more these canals will be kept open and I feel that this way of travel will vanish in the near future which is a shame as the countryside is beautiful and all the people we meet ( including the VNF staff) are friendly and helpful. Barge exits lock towering over me ! 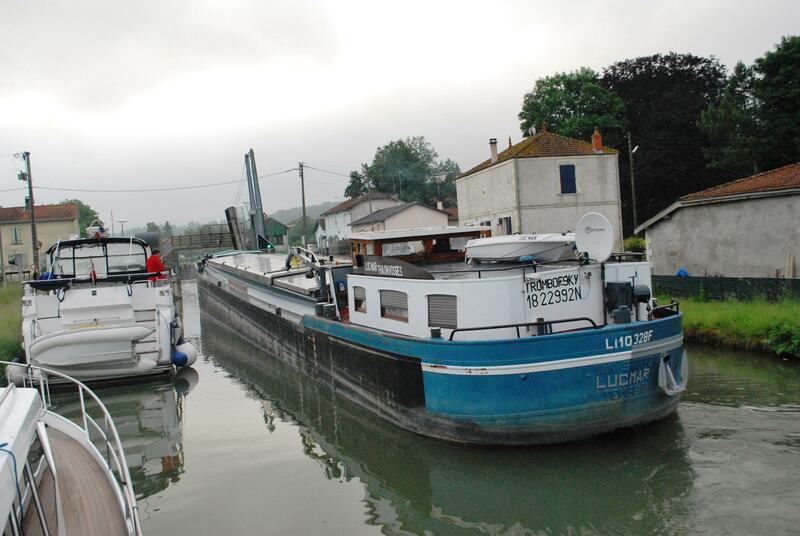 This entry was posted in C'est La Vie - The Boat, Experiences on the Canals, On the Journey, Places visited and tagged Canal de la Marne au Rein, Lonely Loo, Mussey, St Louis Arzviller ladder boat lift, The Tunnel du Mauvages, Tunnel de Foug, vitry le Francois, VNF Staff. Bookmark the permalink. Hi Adrian and Nuala. I really enjoy your blog and hearing about your adventure. Keep going thinking of you. Safe journey.